A really cool cube. I’ve tried to make this kind of touch cube in the past using various craft items (Doll eyes were the best result), and these prints are definitely the way to go. 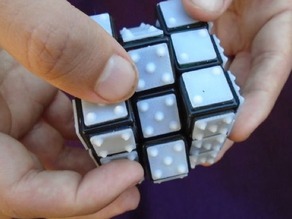 They fit almost perfectly in the Rubik’s brand cube once you remove the color tiles. I used heat shrink pieces as a spacer so the pieces wouldn’t be too shallow. I am going to print more of these using white for the base and swapping out to black for the dots. The next one I will use them on a white speed cube, and hopefully figure out a good way to sink them into the plastic. I’m thinking about cutting a small piece of metal to size, and then pressing it into the speed cube cubies with a soldering iron to create the indentation. Yeah it’s really cool. Did he stick with it? I know he played with it for a while, but I didnt ask if he solved it or not. Im pretty sure he would of said something if he had, he probably got frustrated with it and threw it out the window, just like most sighted people. I’m pretty good with a cube, but trying this without looking really taxes my brain. I’m going to try to keep at it. I can do regular 3x3 blindfold solves (takes forever to memorize and a large fail rate), but I want to see if I can get good at solving this by touch only CFOP. I took a lighter and did a tap-tap-tap with the flame to soften the dots and then lightly tapped them into a smoothed version of themselves. It helped with fingernails catching and sharp edges.